When Wario gets angry and breaks his Game Boy Advance, he takes it to Crygor to have it fixed. The problem is, the new Game Boy doesn't have any buttons, but it does respond to movement. Crazy idea, but Wario calls together his game developers to spew out another couple of hundred microgames for this new device. Most of the time, you have to tilt your Game Boy left and right to control each microgame, though some require you to press buttons instead. Dodge the Bullet Bills, tease the cat, attack the ninjas... all can be done by tilting. You only have a matter of seconds to play each one, though, so react quickly or you'll fail. 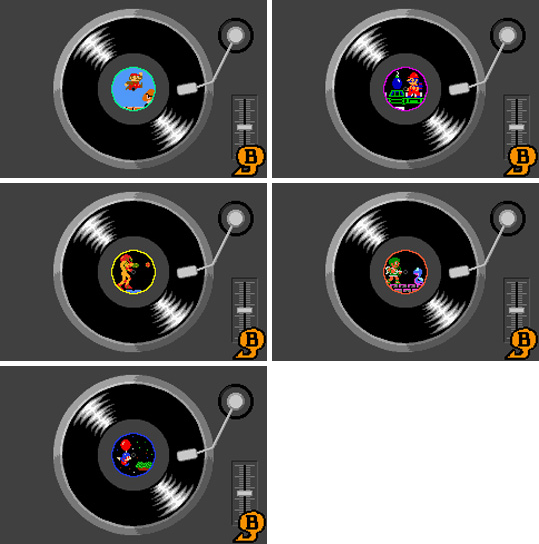 The game includes many minigames without time limits as well, including violin-playing and scratching a record. 'Full' games include the badly-drawn spoof of Metroid, Mewtroid, where you play as a cat with a gun for an arm. Mawaru Made in Wario is as crazy as ever. 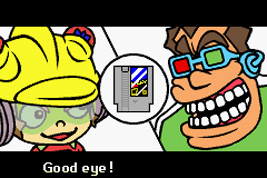 18-Volt finds 9-Volt's NES (Famicom in the Japanese version). 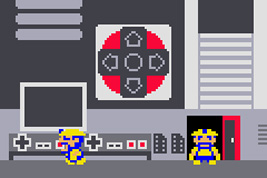 The segments between each microgame are set in a control room inside the NES with 8-Bit style graphics and a + Directional Pad on the wall. When you lose a microgame, one of the workers leaves. In 9-Volt's room there is a R.O.B. NES accessory and an arcade machine. Based on Super Mario Bros. 3 (NES 1988). Move the lift left and right to help Mario and Luigi avoid Bullet Bills and Venus Fire Traps. Based on Super Mario Bros. 3 (NES 1988). 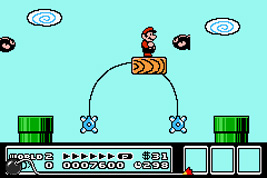 Spin to select the correct power-up for Mario before he lands. Based on Mario Bros. (NES 1983). Tip over the Koopa or Buzzy Beetle shell so it can attack Mario and Luigi. The Koopa Troopa and Buzzy Beetle come from Super Mario Bros. (NES 1985). 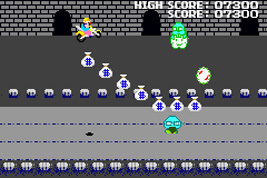 Based on Wrecking Crew (NES 1985). 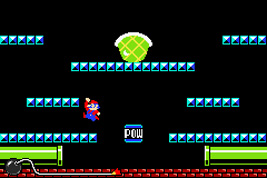 Spin Mario around and press A to hit the bombs before the enemies reach the top of the ladders. Based on Donkey Kong Jr. (NES 1983). 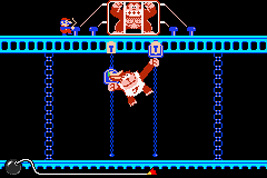 Rock the Game Boy Advance back and forth to make Junior climb the chains and free Donkey Kong. Based on Donkey Kong 3 (NES 1984). Move Stanley and press the A Button to shoot Donkey Kong to the top of the vines. 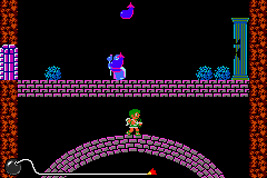 Based on The Legend of Zelda (NES 1986). Spin Link around to deflect the projectiles from the circle of Octoroks. Based on Metroid (NES 1986). 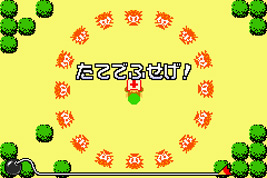 Roll Morph Ball Samus towards the Missile item, avoiding the enemies and acid. Based on Metroid (NES 1986). 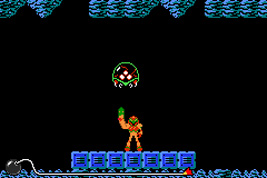 Tilt to aim Samus's gun arm and shoot down the enemies with the A Button. Based on Kid Icarus (NES 1986). Move Pit left and right to avoid the Eggplant Wizard's magic and falling enemies. 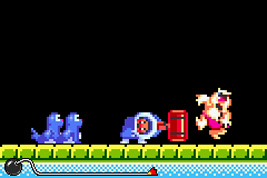 Based on Ice Climber (NES 1984) with updated sprites. Swing Popo's mallet left and right to clear out the Topis, Polar Bears and Nitpickers. Based on Balloon Fight (NES 1985). 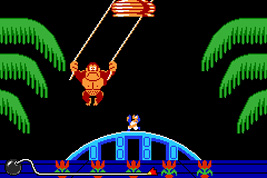 Guide the balloon through the stage to the dangling Balloon Fighter. Based on Clu Clu Land (NES 1984). 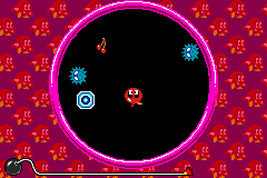 Rotate the stage to guide Bubbles through the enemies and grab the item. 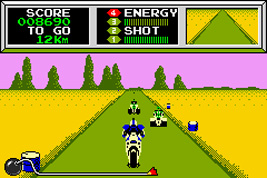 Based on Mach Rider (NES 1985). Steer around corners and obstacles, shooting the enemy riders. 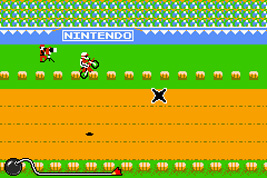 Based on Excitebike (NES 1984). Aim the Excitebike through the floating sparks. 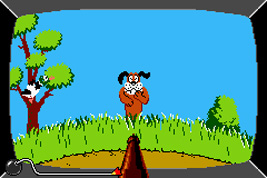 Based on Duck Hunt (NES 1984). Move the gun to shoot at the ducks. 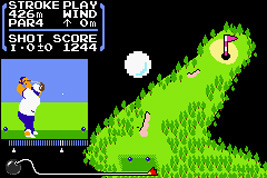 Based on Golf (NES 1984). Spin the entire course to drop the golf ball on the green. 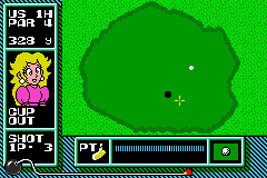 Based on NES Open Tournament Golf (NES 1991). Tilt to move the putting cursor and press A to hit the ball into the hole. 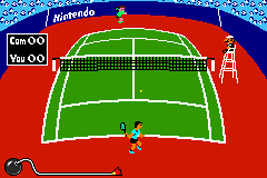 Based on Tennis (NES 1984). Turn the Game Boy to move your player and return the ball. 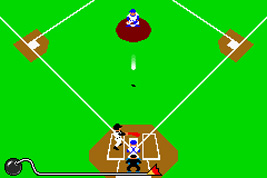 Based on Baseball (NES 1983). Tilt to move the ball around the batsman and get a strike. 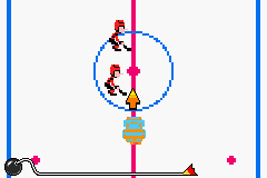 Based on Ice Hockey (NES 1988). Move the fat player around on the ice to shove the other players away. 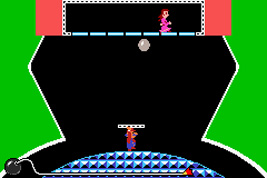 Based on the bonus round of Pinball (NES 1984). Move Mario left and right to keep the pinball in play. 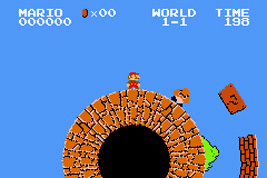 Boss Stage: Super Mario Bros. 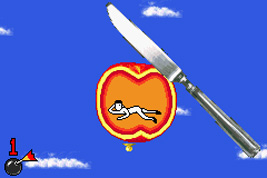 In Mona's microgame "Red Delicious" you have to cut open an apple and reveal the contents. One of the things that may appear is the acrobat from Mario Paint. 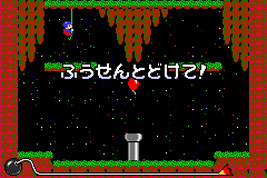 Mona's boss stage, "Skyway Highway" is based loosely on Balloon Fight's Balloon Trip mode. 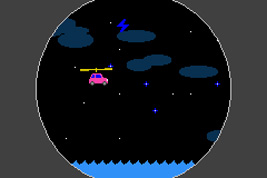 You have to fly the car through the sparks and land on the distant platform. 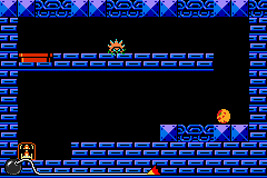 In Kat & Ana's "Weird Science" microgame, you have to press the A Button to make a blue virus jump into a vat of liquid. The virus seems to be based on the blue virus from Dr. Mario. In Kat & Ana's "Bubblegum Blues" microgame, you have to press the A Button to pop the bubble being blown by a dozing boy. The boy's t-shirt changes with each difficulty, from a Super Mushroom to a Fire Flower to a Starman, all from the Mario series. 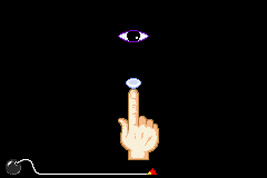 In Kat & Ana's "Contact Lens Solution" microgame, the music is a hummed version of the Super Mario Bros. Ground theme. On the third difficulty of Orbulon's "Boomerang!" 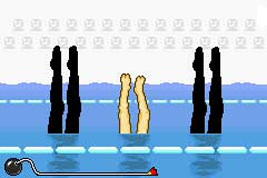 microgame, you have to throw the acrobat from Mario Paint. 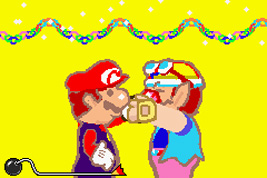 In Warioman's "Burying the Hatchet" microgame, you have to help Wario give Mario a high-five to show there's no hard feelings. 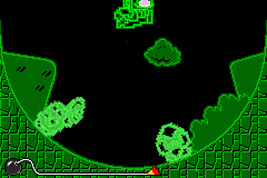 Warioman's "Super Wario" microgame is based on Super Mario Bros. Everything appears in green and black as you help Wario stomp on the Goomba and Koopa Troopa. In the Speed Stage "Chain Letter", one of the clues is "Plumber" and the answer is "Mario". In Dribble & Spitz's "Wheel of Whack" microgame, you have to hit either moles or bald men with a hammer when they pop up. 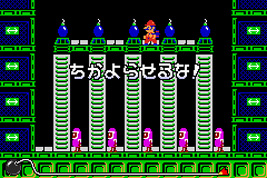 On the third level difficulty, the bald men are dressed like Mario. 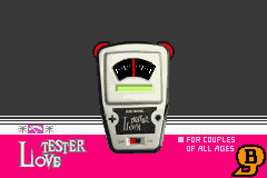 In Warioman's "Crash Prize" microgame, you can see the 8-bit style Wario sprite based on the sprites in Mario Bros.
One of the Souvenirs you can unlock is the Love Tester. This is based on a classic Nintendo toy from the 1970s. One of the Souvenir games you can unlock is "Wario Bike", a meshing of elements from both Excitebike and Super Mario Bros. 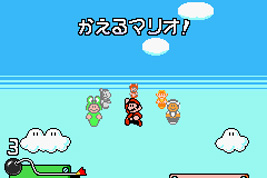 The game features discoloured 8-bit graphics and redesigned versions of Goomba, Paratroopa, Lakitu, Spiny and Bullet Bill. Collect as much money as you can and hit the flagpole at the end. 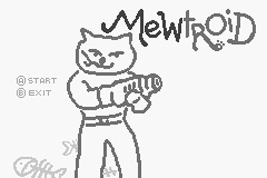 A shooting game starring a cat with a gun for an arm whose name is based on the Metroid series. While the game itself does not resemble a Metroid game, the Brinstar music from Metroid plays in the background. In Japan, the game is called "Nekotroid". 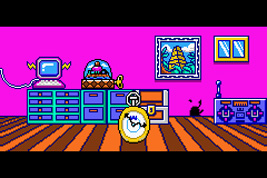 During Wario's intro movie, you can see a treasure chest, the music box from Wario Land 3 and a picture of the Golden Pyramid from Wario Land 4. 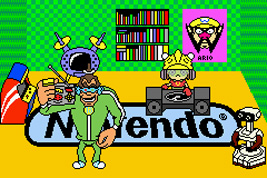 In Mona's Intro, after you play the pizza-making minigame, inside the pizza box you will see the crudely drawn band from the "Garage Rock" microgame in WarioWare, Inc.: Mega Microgames.